Is Christianity changing into an apostate religion? Sadly, I think it is. This really is nothing new, though. Decline from the teachings of Jesus and the early apostles is almost as old as the faith itself. Throughout christendom there have always been religious gurus who each have taught something just a little different from the teachings of Jesus. That difference was often small and subtle, but when combined with the small and subtle different gospels (Galatians 1:6) of other leaders, it soon left us with a religious system completely foreign to that of the early church. A good example of this is the Book of Acts; it is nothing like we see in the church today. Even a quick cursory reading of Acts 2:42-47 will confirm that. However, is a slight variance in belief still rightly called "Apostate?" Maybe we should define the word "apostate" first. It is defined in my dictionary as "a person who completely forsakes his religion, faith, political party or principles." So back to my question: Is a slight variance in belief still rightly called "Apostate?" After all, the dictionary definition says apostasy is a "complete forsaking,"and these people haven't really "completely" given up on their faith, have they? Let me ask another question to those who might wonder about such things: Is a partial truth still the truth? Think about that. Personally, I would have to say, No, it isn't. 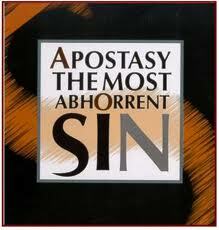 And if it isn't "the whole truth" any longer, then what we are really talking about is "apostasy," aren't we? There can be no middle ground. A woman is either pregnant or she is not pregnant; but she is never partially pregnant. Likewise, a person is either saved or they are not saved; but they are never partially saved. We are either true believers, walking as Jesus walked and taught, or we are "apostates." Those who think they can be somewhere in the middle are in danger of tasting the "spit" of Jesus (Revelation 3:15-16). Ouch! This is really, I think, a great video. I'm going to have to keep an eye on the developments in this so-called "Emergent Church." The video is about 10 minutes long, so grab a coffee and check it out. And as you do, think about my two questions above. Postscript: Among other things, this video speaks about the "Narrow and the Wide Path"(Matthew 7:13-14) and about the Roman Catholic interest in an "Ecumenical" movement, two topics of interest of mine. I am not going to rehash all that at this time, for I have dealt with those topics before on this blog. But as a very quick synopsis, I have often said that most of what we see today in modern so-called Christianity is firmly planted somewhere along that "Wide Path" that, Jesus said, is leading to destruction. How sadly ironic it is that there are many who think they are "saved" who are really quite lost and headed to destruction (hell?). As for ecumenism, the big problem I've often expressed is that though they preach "unity" in the church, which at first glance sounds good, what they are really after is unity of institution as opposed to unity in the Spirit. Here's your opportunity to weigh in. I would love to hear your thoughts. Is a slight variance of belief still rightly called "apostate?" Is a partial truth still "the truth?" Is the modern church on the "Wide Path" heading for destruction? Is ecumenism a good thing? Is the video discussion on the "Emergent Church" a concern for you? “Whoever is not with me is against me, and whoever does not gather with me scatters." Ecumenism won't happen. There are too many different interpretations of the bible to become "one Christian Church" of course the Catholics think this should happen they're one of the largest institutions* on the planet. They create idols and falsely worship them. I am really struggling on accepting Catholic as a form of Christianity especially with the Pope calling for a "one world government" (revelations?) and holding conferences on the existence of aliens. ( Which I can provide links to if anyone wants to read about that) I don't mean to bash on Catholics but it's evident they interpret the Bible differently to myself or many of my friends. So I believe Ecumenism would be a terrible thing to happen to Christianity. As for partial truths, we can't get away with "partial truths" in court I dare say we can't get away with them with God. Mark, thank you for your comment. It is appreciated. Regarding “Ecumenism won’t happen,” I would have to only partly agree. I agree with your view that “there are too many different interpretations of the Bible to become one Christian Church.” That is certainly a problem for THINKING Christians. Unfortunately too many so-called Christians are not of the THINKING variety. Mostly I blame institutional Christianity for that. For too long we’ve become content to simply sit there in neat rows like lethargic ducks lined up in a shooting gallery. We’ve been told when we can sit, when we can stand, when we can sing, and when we can pray, etc, etc. We’ve been told what to believe, and if we think at all, our thinking ironically usually lines up with the thinking of the guy up front. Hmm. For such pseudo-Christians (?) ecumenism all sounds wonderful. After all, they reason “unity” must be what Jesus wanted. They remind us, assuming they’ve read the Bible for themselves, that Jesus even prayed for unity (John 17). In that sense, ecumenism has already happened. There are many non Roman Catholic denominational leaders who have already embraced the pope (just finished watching a video on FB about that) and are answering his call to ecumenism, and by doing so, have embraced “partial truths” which, as we’ve said above, is “no longer the truth.” If ecumenism were TRULY a unity of spirit as opposed to a unity of institution, I might (“might” being the key word) look at it a little closer. That, unfortunately, will NEVER happen because Roman Catholicism would also NEVER relinquish its controlling interest. All this goes even beyond the attempt at unifying only other so-called Christian denominations. The pope is interested in including even other religious groups in this ecumenical push of his. I saw a video of how at one ecumenical service he even permitted the Dali Lama to place a Buddha on the altar. Need we say more? Once the Roman Catholic church has gone as far as it thinks it can in promoting ecumenism, it is my personal belief that we will see that new “one world government” emerge that Scripture speaks of, and we will see a persecution of the true church (that is, those who have not bought into ecumenism) like we have never seen since the days of the early Christians. Jesus’ words, “When the Son of Man comes, will He find faith on the earth?” (Luke 18:8) suddenly become clearer.